The cytoskeleton is a highly dynamic network of filamentous proteins that exists in the 3D space to link all regions and components of the cell. All cells, including bacteria, have a cytoskeleton in one form or another. This network is multifunctional, providing structural support to the cell, a framework for active transport mechanisms and a system for the generation and transduction of mechanical force. The cytoskeleton is analogous to both railroad tracks that connect various parts of a city, and also the steel framework of a high-rise building. One enables the directed delivery of passengers or cargo around a city while the other ensures the building will not collapse under its own weight, and can support a dynamic internal environment. The cytoskeleton maintains cellular organization by linking together many cellular components. It mediates communication across the entire cell and therefore has a tremendous impact on cellular functions. There are three main components to the cytoskeleton. These can be considered as unique networks with distinct compositions that possess slightly different yet interdependent functions. They are microfilaments, microtubules and intermediate filaments. Microfilaments are actin polymers of ~7nm width. They form an extensive network throughout the cell and are primarily composed of actin, which is the most abundant protein in cells. Microfilaments are believed to provide protrusive and contractile forces to the cell and assist in cell motility. They have very high compressive strength however actin binding proteins decrease this and allow bending. Microfilaments act as a major signal transducer from the outside environment to the interior of the cell. Microtubules are the largest cytoskeletal element, being 20-25nm in width, and substantially longer than microfilaments. These filaments play important roles in cell communication and cytokinesis. Microtubules are formed through the lateral association of between 12 and 17 tubulin protofilaments, which arrange to form a very stiff and hollow filament structure. Microtubules are also highly dynamic, undergoing rapid cycles of polymerization and depolymerization in a process known as dynamic instability. Microtubules emanate from a microtubule organizing centre (MTOC) where their minus end is embedded and the plus end grows towards the cell periphery. Amongst their most important functions is to ensure that chromosomes are equally distributed amongst the daughter cells. The movement of cilia and flagella is also microtubule dependent. Intermediate filaments are the third type of cytoskeletal filament and represent a larger group of filaments that share structural and functional similarities. Five types of intermediate filaments have been described, and although each type is composed of different monomer proteins, their mechanism of assembly is consistent and produces filaments of around 10nm in width. Up to 50 different proteins may be incorporated into intermediate filaments. Intermediate filaments form an elaborate network not only in the cytoplasm but also in the nucleus in the form of lamina. They are highly flexible, yet much more stable than both microfilaments and microtubules. Intermediate filaments have no known role in cell motility however they do provide mechanical stability to cells at regions of cell-cell contacts. The steel framework of many of modern buildings is designed and constructed to survive a multitude of forces. External forces such as wind, or earthquakes, must be withstood, while internal forces such as weight must be distributed evenly throughout the structure. In a similar way the cytoskeleton must withstand the vast range of external and internal forces acting on the cell. Aside from a certain degree of flexibility, the framework within buildings is not a dynamic structure, and this is where the cytoskeleton, being extremely dynamic, differs. With the exception of intermediate filaments, cytoskeletal filaments are constantly undergoing cycles of polymerization and depolymerization. When describing actin filament or microfilament assembly this process is referred as ‘treadmilling’. Microtubules on the other hand undergo a process known as “dynamic instability?. 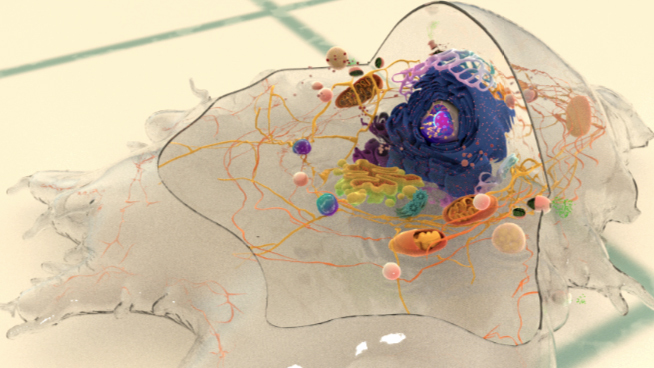 Unlike buildings, cells are living entities that are highly dynamic themselves. They are constantly interacting with their environment and responding accordingly. They may change their shape, or the shape of their nucleus, they may commence cell migration, enter a state of rest or undergo the process of programmed cell death. In order to meet with the requirements of the cell, the cytoskeleton needs to be equally dynamic. For example, during cell migration, the cytoskeleton rapidly changes to produce a polarized cell with a “front” or “leading” edge, and a back or “trailing” edge. The rapid development of a microfilament network at the leading edge, in a region known as the lamellipodia, generates protrusive force, and helps the cell to move forward whilst simultaneously retracting the cell from the rear. In another example, during cell division chromosomes must separate and cellular organelles must be redistributed amongst daughter cells. This is followed by a pinching of the cell membrane into two. These processes require a very dynamic cytoskeleton that can rapidly depolymerize to allow old structures to be dissolved and new structures to be formed. Additionally, when mechanical stress is applied to cells, microtubules rapidly reorient themselves and actin stress fibers increase in density in order to reinforce their mechanical strength. Cell processes such as cilia, flagella also move because of the dynamics of the cytoskeleton within. Cells, like cities, are reliant on the efficient delivery of ‘goods’ or components to specific regions or sites. While cities utilize roads and railway lines for cargo delivery, cells utilize the cytoskeleton for this purpose. Interestingly, the cellular machinery that carries cargo along cytoskeletal filaments is still prone to becoming stuck in traffic, and as such, specific properties of proteins, and even mechanisms, have evolved to ensure cellular components can be transported as efficiently as possible. In some cells where cargo must travel long distances, such as neurons, the passive diffusion of components is not efficient. Not only is it slow, but the gradients of soluble proteins may not be concentrated enough to maintain the supply of components to the process site. The cellular cytoskeleton enables an active delivery of components by providing the ‘tracks’ on which molecular motors can walk. Both the microtubules and microfilaments have specific motor proteins that walk along them. Myosins, for example, walk on microfilaments while dynein and kinesin walk on microtubules. These motors walk in a unidirectional manner and harness the energy released from ATP hydrolysis to undergo conformational changes that propel them forward, essentially in the form of taking a step forward. While one end of the protein holds onto the cytoskeleton, the other end binds to the cargo. This cargo may be contained within endocytic vesicles or synaptic vesicles, or exist as ribosomes or proteins. The cargo is delivered at the end of the filament or whenever the motor detaches from the cytoskeleton. Since this method utilizes energy from ATP, it occurs rapidly, making it more efficient than diffusion alone. However, free or facilitated diffusion along a concentration gradient is important for many cellular processes. Depending on the properties of the diffusing component (e.g. free ions, proteins, lipids), and the lack of an energy requirement, diffusion can be a highly efficient method of intracellular transport. The cytoskeleton acts as the load-bearing network in cells and hence it has a major role in transducing mechanical signals throughout cells. Not only does it act as a bridge between the extracellular environment and the cell interior, but it can transduce signals in a fast and efficient manner. Signal transduction via the diffusion of chemical entities is a much slower process. Signal transduction via the cytoskeleton is made possible, in part, by the multitude of signaling molecules that bind to the cytoskeleton and are activated by mechanical stimuli. Furthermore, due to the ability of the cytoskeleton to link the various cellular components, it can easily transmit signals amongst various compartments such as the Golgi or the nucleus and the membrane. Not only does the cytoskeleton enable the cell to respond quickly to external mechanical signals but it may also generate signals internally. Such signals commonly result from the pull of myosin motor proteins on actin filaments. The effect of external stimuli is apparent in the increase of actin stress fibers and their realignment when cells are exposed to shear stress or plated on certain geometric patterns . In the case of localized stresses there is usually an increase in the cytoskeletal network at that point . Given the widespread role of the cytoskeleton in cellular functions, it is hardly surprising that it is also associated with a large variety of diseases. Certain genetic mutations may result in a weak cytoskeleton that is unable to provide adequate support to the cell. A mutation in the nuclear protein lamin A causes the truncated protein progerin to be formed which is associated with a disease known as progeria. In this disease cells have a weak nucleus due to defects in the nucleoskeleton . Defects in the mitotic spindle are linked to chromosomal instability and subsequently associated with tumors . Remodeling of the actin cytoskeleton is also closely linked to cancers as cells grow in crowded environments with limited nutrient supply . A disruption in the cellular cytoskeleton would result in an overall disruption in cell organization as well as in cellular transport mechanisms. Axonal processes in neurons are a prime example of this. Since axonal processes can be extremely long, their function is highly dependent on microtubule-based transport . Disruption of microtubule function has thus been linked to neurodegenerative diseases and myopathies. These are due to the poor delivery of components to synaptic junctions . A dysfunctional actin cytoskeleton, on the other hand, is often linked to muscular defects. In this case cardiac muscles are particularly susceptible as their activity is largely based on actomyosin driven contractility . Microorganisms such as bacteria can also exploit a host cell’s cytoskeleton and improve the chance of infection. Enteropathogenic bacteria such as Escherichia coli induces the polymerization of actin and the formation of pedestals which they then use to attach to the cell . Others such as Listeria monocytogenes and vaccinia virus use actin tails to propel themselves inside host cells . In another example, the bacteria Clostridium difficile secretes toxins that induce actin reorganization, thus assisting the bacteria in cell invasion . Likewise, microtubule formation and function can also be manipulated by microorganisms. The entry of Campylobacter jejuni and Escherichia coli to the cell are microtubule dependent. This is because depolymerization of microtubules would otherwise inhibit their entry. The HIV virus is also known to disrupt the microtubule network in cells and the microtubule motor protein, dynein, is essential for adenoviral entry into cells . These examples illustrate that the cytoskeleton is not only used by cells for their function, but extensively utilized by pathogenic organisms to facilitate their own functions, leading to the and onset of disease.